I was the pastor of a church in the beautiful river valley area of southern Minnesota for eight years. I loved living there as I relished the daily beauty I encountered. I found joy in lush green hills and a blue sky reflecting on the river. Gazing at the bluffs was a moment to reflect on the goodness of God and the beauty of God’s good creation. Driving along the river would give me opportunity to marvel at blue ice and massive icicles formed from melting snow, as they hung from an outcropping of the bluff. My first years, I soaked up the incredible beauty I was daily immersed in. But as the years passed, I began to take it all for granted. I no longer saw the beauty I was surrounded by. It was simply in the backdrop of my life. I became blind to the extraordinary beauty of my surroundings. Only in the spring, when life crept back into the river valley or the colors of falls arrived, did I take special notice. I wondered if it was possible that we can be surrounded not only by beauty, but blessings, and be unaware? It turns out, we are quite capable of losing sight of both. Preoccupied, busy, and caught up in ourselves . . . we can be oblivious to the marvelous wonder of creation around us . . . while we scurry from place to place, worry to worry. 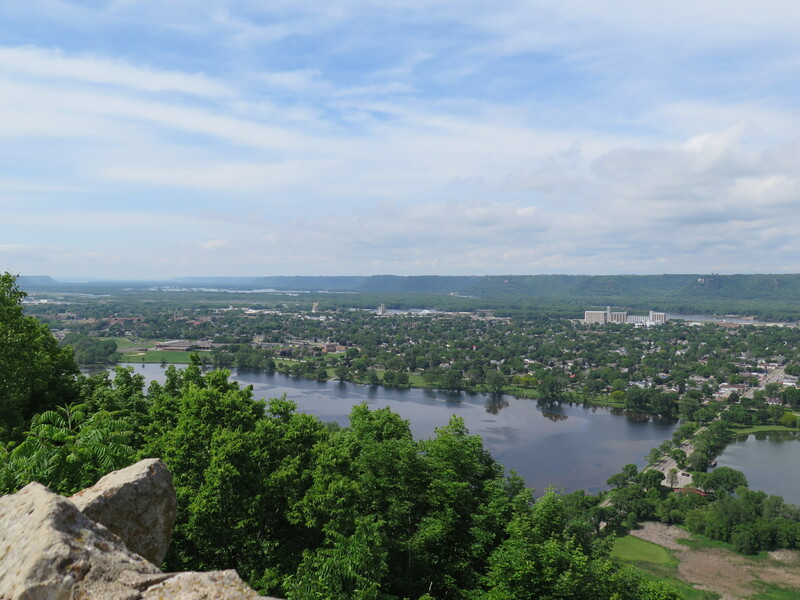 Years removed from my time along the Mississippi, I once again marvel at the stunning site of the river valley whenever I return to visit family. But, I still miss out on the other blessings in my life. Agonizing over the past or living in fear of the future, robs us of our daily share of God’s blessings. We miss out on joy. We don’t notice the special attention a friend gives us, the patience of a co-worker, or the care of a family doctor. Kind words of support or encouragement wash over us, without our ever realizing that it was God who inspired them. Pausing to see the broader picture of our lives gives us an opportunity to reflect on ways we are covered with blessings. It reminds us of the source of grace and goodness in our lives. In our pausing we have cause to give thanks to our creator. This entry was posted in Christian, Faith & Life, Thanksgiving and tagged Blessings, Every good and perfect gift, Every good gift and every perfect present comes from heaven, James 1:17, Let the heavens be glad, Psalm 96 11-12, Thanksgiving, The trees of the forest sing for joy, Winona MN. Bookmark the permalink. So true. It is easy to take things for granted.